Stats Canada says that the average newborn baby weighs somewhere between 2500g (5lbs 8oz) and 4499g (9lbs 15oz). That’s a huge difference, and that’s only the average! There are so many factors that determine whether your little one will be tiny or on the bigger side, and not all of them have to do with the size of your partner and you. Maybe your baby was early, or late. Maybe that’s just the way genetics sorted itself out! We haven’t even taken in to consideration how babies are differently shaped! Some are long and lean, while others are more solidly built. Some have big feet, which complicates footsie pajamas. Some have long torsos, which means onesies are out grown long before they are too small in the shoulders. Stores don’t make it easier either. They all measure differently, with baby sizes coming in vague month ranges or other seemingly arbitrary numbers. How do you know what size your baby even needs? 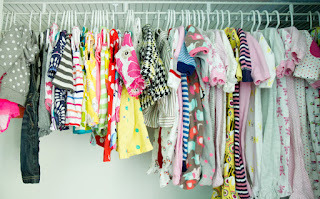 If your baby is born at 6 lbs, you might go through premie, newborn and 0-3 clothes in a matter of weeks! Talk about expensive… Good news! We have done the research for you! We have made some helpful charts, and will offer some hints as to the specifics of some common baby brands. The hardest time to buy baby clothes is that very first month. Even if you knew the gender, the size of your baby is still largely a mystery. Plus they grow so fast! Since newborns are pretty immobile, buy larger than you think you need and stick to the basics. Basic white onsies and pajamas are the name in the game. They will outgrow that 3 piece set in 2 weeks flat (if they ever fit in to it in the first place), and you know they’ll spit up right before grandma’s house anyways. Once you’ve sorted out the early sizing, be sure to have at least a few outfits on hand for the next size up right away. My son went from 6 month, which he was in for almost 4 months to 9 month sizing overnight. He literally ripped a hole in the foot of his pajamas. Then, he was in 12 month sizes within the month. We probably could have skipped 9 months entirely and just rolled up his pants, but since he was so comfortable in 6 months for a while, it was hard to tell! 6 months is also the time when size gaps begin to broaden (or become completely random) at some stores. Old Navy, for example, classes some items 6-12 months, and they don’t all fit the same. I have a romper that my 14 month old seemed to skip over entirely, but he has a pair of 6-12 month shorts that still fit him quite well, despite his current sizing being largely 18-24 month! And don’t get me started on shoes… Did you know that shoes seem to be sized 0-6 months, 6-12 months, 18-24 months, then sizes 4-13? How does that make any sense? We've noticed that Carter's clothes (especially pajamas) fit slender, and the pants fit long. Joe Fresh seems to be a bit wider than most, which is most noticeable in the onesies. Walmart clothing (for infants anyways) seems to shrink up and bunch in the wash. Items with zippers get that buckled effect. Gymboree items wash great and the quality is fantastic, but watch for a sale. The prices might not be worth the amount of time your child is in a given size! Here's a handy buyer's guide we've created to pick out some of the differences.